The rallies and walkouts at the University of Missouri have inspired students at other colleges to fight for equality on their own campuses as well. 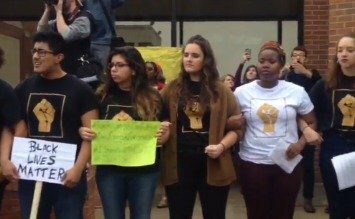 This week, students at Ithaca College launched their own protests and are calling for their president, Tom Rochon, to step down as well. The college, named for its location in Ithaca, New York, sees statistics similar to Missouri when it comes to diversity — or the lack thereof. During the fall of 2015, 71 percent of students were reported to be white, while just 5.5 percent were Black, according to the school’s website. Similarly, in the fall 2014 semester, 87 percent of the college’s employees were white, while just 11 percent were Black, Hispanic, Asian or Native American. A protest on the school’s campus yesterday, organized by the People of Color at Ithaca College, saw more than 750 attendees. Activists chanted, “Tom Rochon! No confidence!” The chant refers to a campus-wide vote the People of Color at Ithaca College has called for that asks students to vote “confidence” or “no confidence” in Rochon. Students have requested responses by Nov. 30. Like in Missouri, Ithaca’s faculty is getting involved as well. On Tuesday, the Faculty Council passed a motion to hold its own vote regarding Rochon. According to the chair of the Faculty Council, Peter Rothbart, the referendum will include full-time faculty members, professional librarians, and phased retired faculty. On Tuesday, Rochon announced the creation of a chief diversity officer position at the college. According to Rochon, the process will begin at the end of this semester, and the position will be filled by the spring. He also said students will be informed on who will be on the committee responsible for filling the position. “Given the importance of the duties of this position for the entire campus, the composition of the committee and the search process itself will be inclusive and transparent, with special attention to the needs and perspectives of students, faculty, and staff,” Rochon said. Currently the school has an associate provost for diversity, inclusion and engagement, Roger Richardson, and he will serve as the interim chief diversity officer. However, given the growing number of racially charged incidents occurring on campus and the rising racial tensions, Rochon’s attempt at diversity is too late. One incident being highly cited took place in August during RA training with two campus public safety officers. According to students, one of the officers responded “very aggressively” when students asked how racial profiling is being addressed on campus. Another student was upset when a different officer said he would shoot someone who he saw carrying a BB gun. The comment was reminiscent of the tragic fate of 12-year-old Tamir Rice, who was gunned down by police while playing with a toy gun. Students have made complaints and a meeting was scheduled between RAs and public safety. However, according to students, race was not discussed at all at the subsequent meeting, and one of the officers involved in the initial incident was not even present. Another incident occurred on Oct. 8 at an on-campus event, Blue Sky Reimagining, which seeks to “formulate ideas about the evolution of Ithaca College.” One panelist, who is a woman of color, said she had a “savage hunger” to succeed. Following this comment, two Ithaca alumni called the woman a “savage” throughout the remainder of the event. In general, the college cannot prevent the use of hurtful language on campus. Such language, intentional or unintentional, exists in the world and will seep into our community. We can’t promise that the college will never host a speaker who could say something racist, homophobic, misogynistic, or otherwise disrespectful. Even so, we reaffirm our commitment to making our campus an inclusive and respectful community. Of course, no campus will ever have control over people making insensitive or even blatantly racist comments towards others. However, nowhere in his statement does Rochon elaborate on his “commitment” to diversity and inclusion. He simply “reaffirm[ed]” a commitment that, as far as many students and faculty are concerned, is nonexistent. “We understand that the issues are serious and significant, and we are listening. I am certain that Ithaca College will emerge from this chapter strong and more resolute in its direction forward, and the board and I are actively partnering with Tom Rochon and other campus leaders to make sure that happens,” Grape’s statement concluded. However, depending on the outcome of the Nov. 30 vote, it may be too late for Grape’s sentiments as well. The college has already made clear its lack of confidence in Rochon, and it seems unlikely that this will change without swift and significant action.